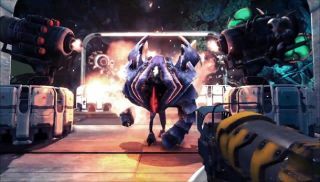 Coffee Stain Studios released a teaser trailer for Sanctum 2's latest batch of DLC, and while the video might not have as many cheesy lightning bolts as the previous DLC's trailer , I suppose raw gameplay footage is an acceptable option as well. The latest batch of downloadable content will net you four new maps, a circular saw for all your eviscerating needs and a nail gun to patch things up once evisceration starts to grow stale. As for defenses, there's a new “Makeshift” tower that can dish out critical hits, but will shut itself off whenever it feels like it. Super. Those who aren't the gambling sort can try the other new tower, which hands out bear traps like floss at a dentist's office. The added weapons should be handy against the two new enemies, the “Jumper” and the “Infected Explorer,” whom you see taking missiles in the back at almost point-blank range like it was a therapeutic massage. The new baddies come alongside seven new perks and a rank cap increase to help keep the battle against these missile-resistant mutants at least somewhat even. Ruins of Brightholme is sitting pretty on the Steam store at $3.99 USD right now, though you don't need to drop the extra cash if you've already purchased the season pass. You just need to saw that infected explorer's legs off before he reaches my doorstep.